Have you been craving pistachio pudding but don’t want to resort to the packages of pudding because they’re loaded with artificial ingredients? If so, you’ll love this naturally flavored gluten free pistachio pudding. You can make super healthy by blending the nuts into the pudding or straining them out. Either way, this pistachio pudding is delicious. My husband is not a pistachio fan and he said that he was very impressed with the results. Enjoy! Now, when you reach for a sweet snack, feel good that it is loaded with tons of nuts with protein and fiber. This gluten free pistachio pudding is just plain creamy good! Soak the nuts in the milk overnight in the refrigerator or at least 8 hours. Add them both to a large saucepan along. Simmer over medium heat for 40 minutes. If you want a smooth pudding, strain out the nuts and discard or use in a protein shake or something else. In a separate bowl, whisk together the sugar, arrowroot powder, and salt; set aside. 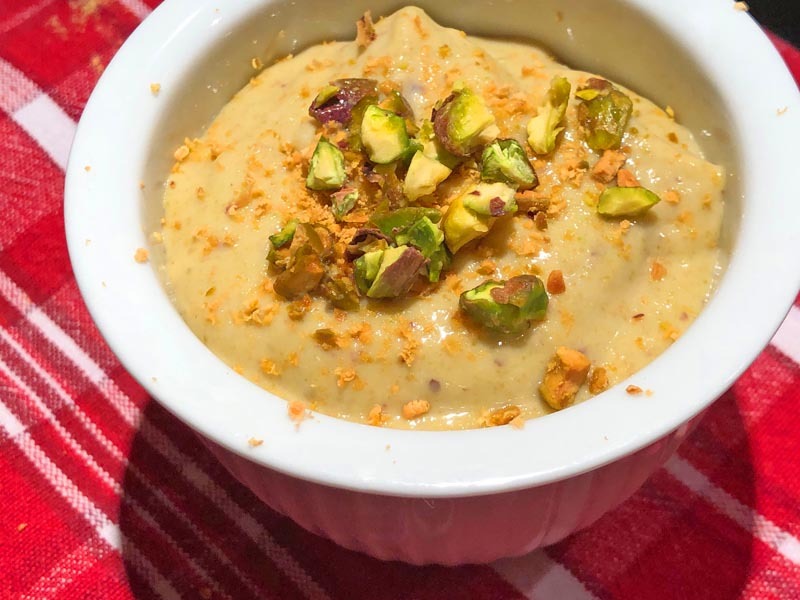 If you haven't strained out the nuts and wish to add additional fiber and protein to this pistachio pudding (like I did), using a hand blender or countertop blender, puree the mixture. If using a countertop blender, return the mixture back to the saucepan. Remove the pudding from heat and whisk in the sugar-arrowroot mixture, constantly stirring, and returning to the burner. Increase heat to medium-high, while constantly stirring to prevent sticking and burning. Once it comes to a boil, it should be thick. Remove from heat and pour into individual 5 - 6-ounce ramekins or 1 large bowl. Allow the pudding to cool to room temperature, cover, and refrigerate. Garnish with chopped and/or grated (or both as I did) pistachios.